ICREA-Complex Systems Lab blog | Our take on science, posts about our papers and the papers of our friends. Early this morning Marty McFly has arrived to the future. It is true that cars don’t fly quite yet. Hoverboards are not available either. Households are not powered by their own nuclear reactors and clothes don’t dry and adjust automatically. Good old Marty has got reasons to be disappointed. But advances in some other directions have been astonishing during the last 30 years. Who could foresee the transformative power of the internet? Everyone is plugged to a tablet or smartphone, immediately accessing far away friends and personalized web content. Synthetic biology is taking its first, promising steps (to which we are glad to contribute) and advances in prosthetics and Brain Computer Interfaces are bringing back motility and communication to injured patients. An early breakthrough in Brain Computer Interfaces (BCIs) was the P-300 speller. These devices show a matrix of letters with rows and columns that are highlighted in a random order. The user of the interface focuses on the position of the matrix containing the letter that she wishes to spell. Whenever the letter is highlighted, a very characteristic signal called P-300 mounts up in her brain and is readily picked up by an electroencephalogram (EEG) apparatus. This way, people without motility can build words and sentences, literally, right out of their thoughts. P-300 is a complex macroscopic signal of our brain. Its most robust feature is a positive deflection of the electric potential that can be registered in the central channels of the EEG. This signal is associated to perceptions (often visual or auditory) that catch your attention over other, more neutral stimuli. Nice examples are your next letter being highlighted above others in the matrix speller; a random, high-pitched tone amid a regular series of low notes; and, arguably, someone calling your name in the middle of a crowd. Some people suffer terrible conditions that do not allow their gaze to roam freely, so they cannot focus on distinct positions of the matrix. Rapid Serial Visual Presentation (RSVP) of letters right at a user’s fixation point allow them to benefit from fast BCI spellers anyway. Above: Average electric activity at the central channel of an EEG reproducing P-300 (violet) and background (gray) signals. Below: Average electric activity in a scalp during P-300 activity. And why should we stop with letters? RSVP and P-300 make the perfect scenario for sci-fi movies but also for serious research and technological developments. For example, we could throw more or less random polygons, filled with different colors, at a blank screen and hope that some of them will catch the attention of a user connected to an EEG. 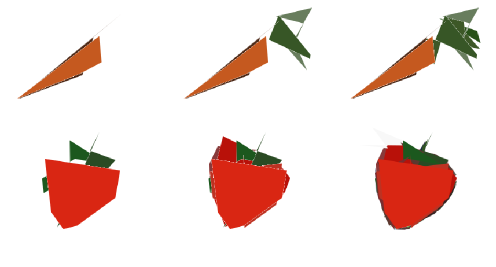 Could these polygons elicit a P-300? Perhaps, if they remind the user of some image in her mind… if they match a tiny detail or the overall color of that scene she’s thinking about! We could proceed incrementally, capturing these tiny details and accumulating polygons to form more complex drawings — just as we do with letters in a sentence. This idea was envisioned and developed by Complex Systems Lab member Luís Seoane and his colleagues Benjamin Blankerz, PI at the Berlin Brain-Computer Interface, and Stephan Gabler then at the Bernstein Center for Computational Neuroscience in Berlin. In a paper published this summer they show how those Images from the Mind could be reconstructed based on the P-300 EEG signal. While the images where fairly simple and the settings of the experiment were cautious, the very positive results indicate that faster BCIs for image reconstruction are possible. Some interesting future designs are discussed in the paper as well. We hope that this work makes a nice contribution to this relevant technology that can greatly impact the lives of many people. 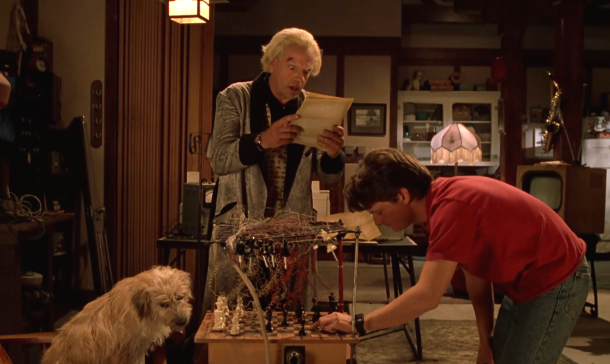 Back to Marty and Doc’s adventures for today, surely BCIs can help them finish their chess game against Einstein. We hope that they are enjoying the unexpected twists of technological evolution that brought us this far… at least while all the other promised gadgets don’t get going. Video of a P300 speller by the Neuronal oscillations and cognition group, Dept. Intergrative Neuophysiology, CNCR, VU University Amsterdam. Paper by Laura Acqualagna and Benjamin Blankertz proposing a RSVP speller. Seoane, Gabler, and Blankertz’s paper proposing a RSVP-based BCI to reconstruct images with the mind. Successful reconstruction of a cherry. The team led by Joshua S. Weitz, Associate Professor in the School of Biology from the Georgia Institute of Technology, has developed BiMat, an open source MATLAB package for the study of the structure of bipartite ecological networks inspired by real problems in microbiology and with broader applications. Cesar O. Flores, a researcher who graduated from the School of Physics of the same Institute, was the lead developer of the software tool, published in the journal Methods in Ecology and Evolution. 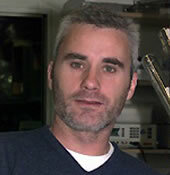 Sergi Valverde, Visiting Professor in the Complex Systems Lab from the Department of Experimental and Health Sciences of Pompeu Fabra University (DCEXS-UPF), and Timothée Poisot, Assistant Professor in the Department of Biological Sciences of the University of Montreal, are involved in the project. The study of ecological networks helps to understand the biodiversity of our environment and to predict possible extinctions. Bipartite networks are a special type of ecological network where individuals of a certain species interact with individuals of different species. Bipartite networks are ubiquitous in community ecology, such as the relation between phages (viruses that infect bacteria) and their bacterial hosts. As Valverde comments “complex networks show common patterns, like nestedness and modularity, and their ecological and evolutionary effects can be studied using theoretical and computational methods”. 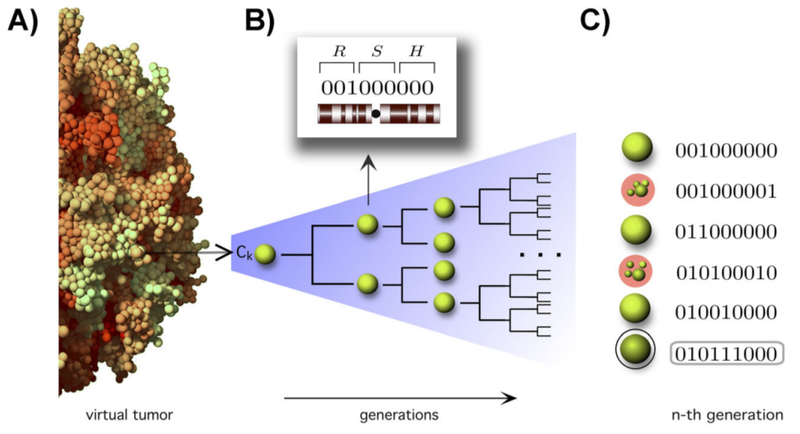 A number of tools have been developed to analyze bipartite networks, but BiMat includes new features available for the first time in a single package. Apart from enabling the identification of the key patterns and the evaluation of their statistical significance, this new tool is also capable of performing multi-scale and meta-analysis of the structure of multiple networks. Furthermore, BiMat includes several visualization tools to explore bipartite networks in either matrix or graph layouts. BiMat was inspired by real problems in microbiology context. It is applicable generally for the analysis of systems represented by bipartite networks. Prominent examples of bipartite networks include mutualistic networks (e.g., plant-pollinator interactions) and antagonistic networks (e.g., virus-plant infection networks). BiMat has been developed in an object-oriented environment for both MATLAB and Octave platforms. This design enables easy access to all methods and allows for future open-access extensions by the research community. In addition, the companion website provides an extensive quick start-guide and tutorials. Cesar O Flores, Justin R Meyer, Sergi Valverde, Lauren Farr, Joshua S Weitz. 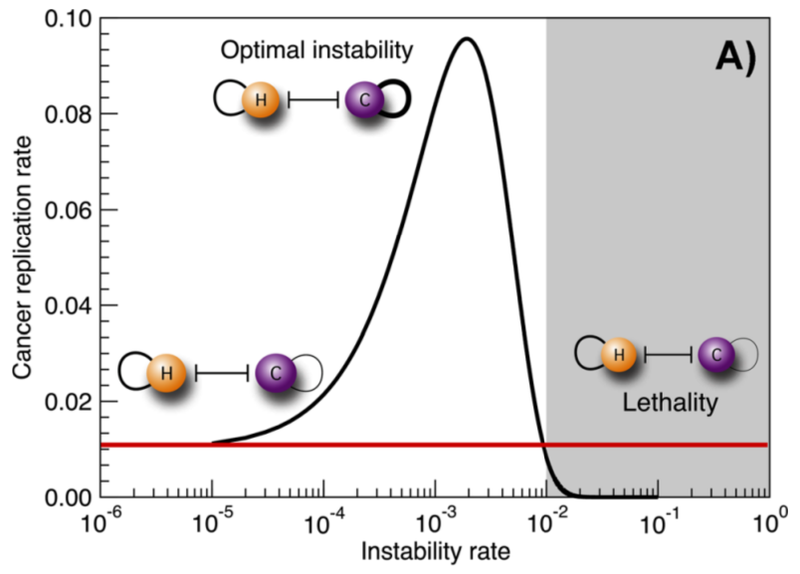 Statistical structure of host–phage interactions. Proceedings of the National Academy of Sciences, 108(28), E288-E297. El proper dia 23 de Desembre podrem gaudir de la segona edició de les conferències “Ciència al Nadal”. Una nova sessió apassionant de divulgació científica per a tots el públics, que en aquesta ocasió tindrà lloc al Centre de Cultura Contemporània de Barcelona. El dr. Ricard Solé (investigador al front del Complex Systems Lab de la Universitat Pompeu Fabra) obrirà la sessió tot introduint el tema central d’aquesta edició: la consciència. A partir de preguntes fonamentals com “què és la consciencia?” o “quina és la seva seu?” gaudirem d’un repàs de les teories més influents dels últims segles, fins a plantejar-nos si algun dia podrem construir una màquina conscient. A continuació serà el torn del dr. Carles Lalueza Fox (líder del Paleogenomics Lab de la Universitat Pompeu Fabra), qui ens farà retrocedir fins als primers orígens del pensament simbòlic humà. Ens explicarà què ens revelen les eines i ornaments de les societats prehistòriques sobre el seu pensament i llenguatge, i veurem que la nostra espècie no ha estat la única que els ha manifestat. Finalment, el dr Gustavo Deco (qui lidera el Grup de Neurociència Computacional de la Universitat Pompeu Fabra) ens farà mirar de nou al present i al futur. Els descobriments més recents sobre l’organització i el funcionament del cervell, han portat als científics a representar l’arquitectura del cervell com una gran xarxa (el conectoma). Veurem que aquesta aproximació ens ajuda a entendre com processa informació el nostre cervell, així com el marc teòric i experimental que haurem d’afrontar per continuar aprofundint en el coneixement de la consciència. 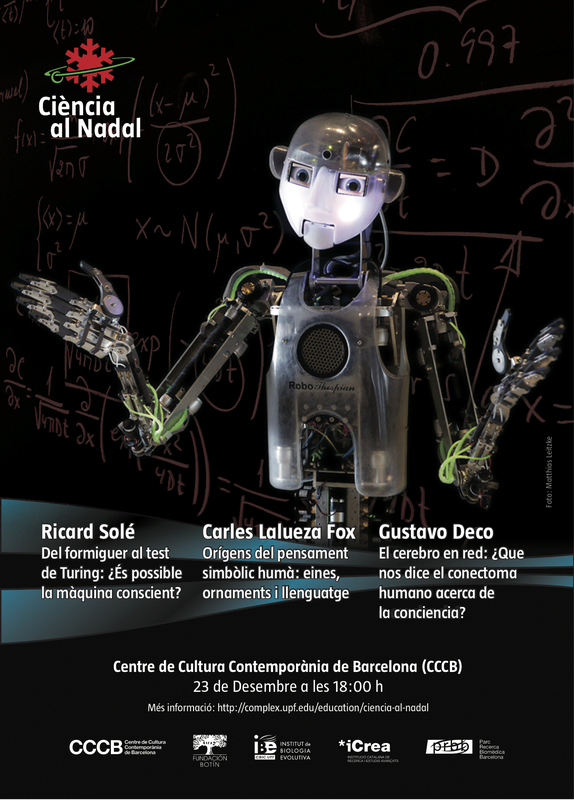 Next December the 23rd we will enjoy the second edition of the “Ciència al Nadal” conferences. This year, the fascinant meeting for science’s dissemination will take place at the Centre de Cultura Contemporània de Barcelona. Dr. Ricar Solé (leader of the Complex Systems Lab at the Universitat Pompeu Fabra) will be opening the session, introducing the central topic of this edition: consciousness. Starting from fundamental questions as “what consciousness is?” or “where does it resides?” we will enjoy a brief review of the most influential theories from the last centuries, which will lead us to think about whether or not we will be able to build up a thinking machine. Then dr Carles Lalueza Fox (leader of the Paleogenomics Lab at the Universitat Pompeu Fabra) will led our thoughts back to the origins of the human symbolic thinking. We will learn what kind of information about prehistoric language and thinking is revealed from fossil ornaments and tools, and we will also find some evidences that our species has not been the only one to manifest such cognitive traits. Finally, dr Gustavo Deco (who leads the Computational Neuroscience Group at the Universitat Pompeu Fabra) will take us back to the present, and the next future. Recent studies on brain organization and function have lead researchers to represent brain’s architecture as a huge network: the conectome. We will see how useful this approach is in order to understand how information is processed in the brain, and what theoretical and experimental challenges will have to be overcome to achieve further knowledge on consciousness. The article (coauthored by Ricard Solé, Sergi Valverde, Carlos Rodríguez-Caso, and Josep Sardanyés) proposes that the instabilities that usually harm our health might be used by a tumor as an engine driving its evolution and replication — faster and more efficient as it degrades. Cancer cells shall achieve this by cutting out non-essential tasks, but the prize to pay is that of memory: tumors won’t have any regards towards their origins — well ordered, healthy tissues. And there is some light in there! Since tumors feel more comfortable as highly unstable entities, they might cross the thin line separating them from a not-viable biological form. And if a tumor is not ready to jump across this line we might be willing to provide a little push!! This has already been suggested and tested for RNA viruses with interesting theoretical and experimental results. At the Santa Fe Institute. At the Pompeu Fabra University website. At EFE Futuro, by the EFE News Agency. This is one of the most active research lines of the Complex System Lab, and it is fair enough to say that we made some of nicest contributions to the field. We could even implement the first steps towards synthetic computing in the lab, thanks to our collaboration with Francesc Posas and his research group on cell signaling. So: what are the differences between our Synthetic Multicellular Computers and a standard electronic computer? Do we need to change the way we design the circuits? Can we still rely on our good old logic gates such as the NAND and the XOR? Or do we need to look at Boolean logic in a new way? Break apart your circuits, but not in the usual way! Surely everybody thinks about building modules when programming and soldering a circuit together, but eventually all electronic computations are channeled to a single wire with the outcome of a logic function: 0 or 1. When working with cells we do not want this final step: we allow that the whole 0/1 decision be taken by any component anywhere in an assembly of cells, each of which is computing little parts of the big circuit. Forget about copper: cables are chemicals! The step before is possible because our cables are not anymore a long thread conducting electricity. In electronics, each cable is either ON or OFF; now we make an abstraction and a chemical represents a wire, and its presence/absence among our cells is equivalent to the required ON/OFF states. What a weird cable: it pervades the whole space where the computation is going on!! And dismiss the NAND logic! The two previous steps had been already proposed previously and they are the tricks that enabled us to compute with cells in the lab. In the new work, Javier and Ricard explore what are the most convenient building blocks for this distributed computation and chemical wires. And their results suggest that we should pension off the NAND gate. In electronics we do not want to use a lot of logic gates because they are costly. But wires are for free. That’s why NAND gates are fine enough to make beautiful electronic circuits. In biological computing, logic gates might not be so expensive but wires are. Because each wire is a different molecule, it is necessary to genetically engineer cells as to recognize the different possible signals. And this is difficult up to day, so the less wires the better! If we attempt to design circuits with the new constrains, the star is the N-Implies (see the picture below). This, together with the classic AND and NOT logic gates allows to make simple, reusable, and scalable components with which to build larger circuits — and, perhaps soon, a Synthetic Multicellular Computer! How does all of this look like? In the next drawing we see a 4-Input 1-Output Boolean function implemented with the classic electronic design and with the alternative N-Imply based logic. We can see how the system has been broken apart: it consists of two modules that don’t talk to each other. The score, by the way, is 26 – 13: we need 26 logic gates (and 22 cables) to build the electronic device, while the biologic counterpart only needs 13 logic gates (i.e. 13 bio-engineered cells) and 10 chemical wires. After a long enough break, we are back to feature a 2010 paper by CSLab fellows. We are talking about former member Bernat Corominas-Murtra and group leader Ricard Solé, and their long-lasting effort to clear up Zipf’s law. As you may know, Zipf’s law is one of the most famous statistical regularities that we can find everywhere: from the size of cities within a country to the frequency of words in a text. It’s enchantments fascinate many, as it appears linked to many odd phenomena that still demand an explanation; and its presence everywhere led many others to think that it is meaningless. Universality of Zipf’s law is a very elegant analytic tour de force that explains how Zipf’s law emerges as the only limiting solution between complete randomness and trivial complexity. This emergence happens in boundless situations, where a system is allowed to occupy random states of an ever-growing ensemble. In this situation, only the Zipf’s law retains some meaningful complexity! Any other solution — and here we speak of statistical regularities of some observable — will either be completely random or trivial. This intends to shed some light about those very diverse phenomena that display Zipf’s law and whose nature is likely open-ended. In a following paper our colleagues, together with Jordi Fortuny, applied a refined version of the reasoning in Universality of… to an actual system: the evolution of communication, in which taking into account the path dependence of evolution is crucial. There is something dark and fascinating about Zipf’s law that seems to invoke unbounded systems, path dependence (somehow implying non ergodicity), criticality, and many others of our favorite pets is complex systems. What’s going to be the next breakthrough here? Si vols assistir, ajuda’ns a calcular el lloc que necessitem inscrivint aquí!! La importància de donar a conèixer el que els científics anem descobrint resulta especialment important dins aquest segle XXI on ens enfrontem a reptes com el canvi climàtic o la nostra relació amb una tecnologia que canvia a gran velocitat. La ciència no coneix fronteres ni es posa límits, i als darrers 50 anys hem vist com algunes de les grans qüestions que sempre s’han considerat de naturalesa filosòfica, com l’origen de la vida, l’univers o la consciencia han entrat de ple dins del territori de l’anàlisi científic. 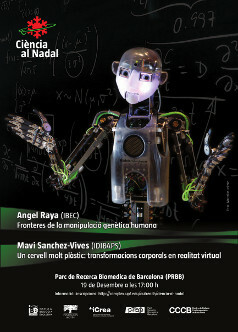 Tanmateix, els avenços en física, química, biomedicina, genòmica, neurociència, robòtica o biologia evolutiva ens han donat una nova visió de nosaltres mateixos, dels nostres orígens i del potencial per modificar la nostra existència que sovint deixa enrere la ciència-ficció. Una societat responsable i crítica hi ha d’incorporar el coneixement científic al seu sistema educatiu però també al debat diari. Cal reivindicar el coneixement i el pensament racional com a part essencial de la nostra cultura. Aquesta no és només una possibilitat desitjable: és imprescindible. Com deia Carl Sagan, la ciència és una llum a la foscor, una llum que cal mantenir viva. Amb aquest esperit, comencen aquest any a Barcelona les primeres conferències de Ciència al Nadal. Angel Raya és investigador ICREA al Institut de Bioenginyeria de Catalunya (IBEC) on dirigeix un grup de recerca sobre cèl·lules mare. Va doctorar-se a la Universitat de València, on va fer els seus estudis de medicina, i ha investigat al Salk Institute, als Estats Units. Al 2006 va incorporar-se com a coordinador científic del Centre de Medicina regenerativa, fins al 2009, quan va integrar-se al IBEC com a professor investigador ICREA. La seva recerca dins d’aquest camp ens permet comprendre un gran nombre de fenòmens associats amb els mecanismes de regeneració de teixits i la reprogramació de cèl·lules mare. 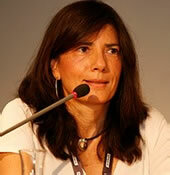 Maria V. Sanchez-Vives és investigadora ICREA a l’Institut d’Investigacions Biomèdiques August Pi i Sunyer (IDIBAPS), on dirigeix el Grup de Neurociències de Sistemes. Ha fet recerca a la Rockefeller University i a Yale, així com a la Facultat de Medicina de l’Institut de neurociències d’Alacant. Investiga en un ampli ventall de problemes de frontera dins les neurociències, en particular els efectes sobre el processament de la informació i la percepció del cervell en entorns de realitat virtual. Aquesta recerca permet entendre millor la complexitat de la funció cerebral i té enormes implicacions mèdiques.